If you live in Kentucky, you know there are farms in just about every nook and cranny of the state. Kentucky Farm Bureau Insurance protects more than 65,000 of those farms. Our agents are hometown people delivering honest answers, good advice, and quality customer service from within your community. We have adjusters throughout Kentucky. When you file a claim, you can expect it to be handled quickly and efficiently. Contact your local agent for more details about policy coverages and availability. No matter where you live in Kentucky, there's a local agent near you. From poultry farms to peach farms, we've got you covered. 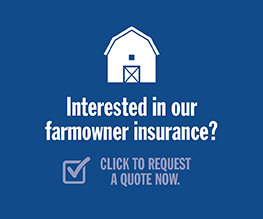 Your local Kentucky Farm Bureau Insurance agent will help you select the protection that meets your needs. You can even tailor your policy to provide additional coverage to your dwelling, contents, farm equipment, and farm buildings. Kentucky Farm Bureau knows farms — and we understand how costly owning one can be. Check out a brief description of some of our discounts below. If you're interested in learning more, chat with your local agent for specific rules and eligibilities. If you have an active automobile policy with us, you are qualified for up to a 20% reduction in your annual premium. If you live in a newly constructed home, you may be eligible for a discounted premium. We'd be happy to reward you for safety enhancements made to your property, such as deadbolt locks, smoke alarms, fire extinguishers, security alarms systems, sprinkler systems, and more. This discount applies when you have a newer roof on your home. We love to reward good members! Claim-free members and/or those with a qualifying insurance score may be eligible for a discount.